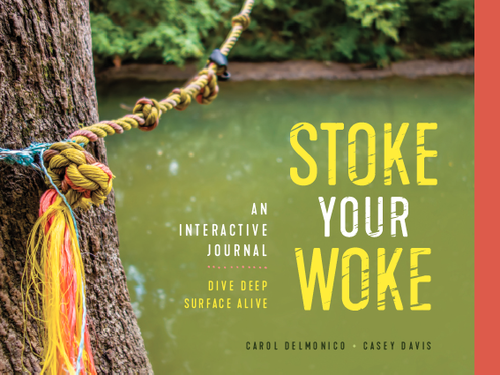 Stoke Your Woke was conceived on a smoke filled morning in August of 2017 and birthed when 225 books landed on my front porch two weeks ago! It’s been an inspiring, super fun, and creative project. A collaboration with my friend, and co-conspirator Casey Davis. Putting a book out into the world is both thrilling and scary. It reminds me of sending my children to kindergarten. I felt excited, worried, and nervous. I wanted them to be liked, even to be loved. I wanted them to be seen for their uniqueness, to be respected by others, to be welcome. I'm wanting all those things for our book. I’m inviting you to enter our world. I know it won't be for everyone and I trust, just like my children, it will find its way into the hearts and minds of those who connect with it. When delving into our book you'll not only see us, you'll see yourselves and the world around you with a fresh lens. Stoke Your Woke is an inclusive space. We envision people that think differently being able to go through this journal together and come out feeling more care for one another. A listening space, built to wonder and connect deeply. A landing and launching pad. A “third thing”. A much needed entry into the mystery of our beliefs, habits, thoughts, feelings, and lifestyles. You can preview it here. If I’ve peaked your curiosity I invite you to join us in delving into these evocative questions. I believe you will find beauty in it! I believe you will have “aha” moments. I believe, if you share this with a group, you will fall in love with people you thought you didn’t like. I believe it’s an antidote to loneliness because you’ll connect more deeply with yourself. I believe that listening is love in action. This book is a listening space. I believe self-responsibility and interdependence are keys to our thriving. This book will help you hone both. It will “Stoke Your Woke” promise! Lastly. I'd like to ask you a favor. I remember needing a lot of help when my children were born. I didn't get really comfortable asking, and was overwhelmed much of the time. I am learning how to ask now. If you are inspired by our mission, and our book, would you please share this with your social media tribe, or to your friends via email? You can sign up for updates on our website too. It takes a village to bring a book into the hands of many. Thank you.